Crude oil is, at the present time, the source of most fuel oils for marine use. Synthetic fuels are being developed but will probably be too expensive for ship propulsion. Solid fuel, such as coal, is returning in a small way for certain specialised trade runs. The various refined products of crude oil seem likely to remain as the major forms of marine fuel. Fuel oil treatment system – From the settling tanks fuel oil is transferred to the service tanks via FO treatment system. For cleaning of heavy fuel oils (HFO) the two stage process is commonly used. The fuel is heated in a settling tank to about 50-60°C and then is drawn out by the purifier inlet pump. The inlet pump delivers the fuel to a thermostatically controlled heater which raises the fuel temperature to about 80°C, and thence to the centrifugal purifier. The dry purified fuel is then transferred to a centrifugal clarifier by the purifier discharge pump. After clarification the clarifier discharge pump delivers the fuel to the service tank for the engine use. Details of fuel oil treatment :The refining process for crude oil separates by heating and distillation the various fractions of the oil. Paraffin fuel would be used in gas turbine plants, gas oil in high- and medium-speed diesel engines and crude oils in slow-speed and some medium-speed diesels. Paraffin and gas oil are known as 'distillates', which are free flowing, easily stored and can be used without further treatment. Residual fuels, however, are very viscous or thick at normal temperatures, and require heating before use. Additional treatment to remove harmful chemicals or sulphur may be required for all or some of the refined products, depending upon their application. Finally blending or mixing of the various oils is done to provide a range of commercial fuels for different duties. Fuel oils have various properties which determine their performance and are quoted in specifications. The specific gravity or relative density is the weight of a given volume of fuel compared to the weight of the same volume of water expressed as a ratio, and measured at a fixed temperature. Viscosity is a resistance to flow. A highly viscous fuel will therefore require heating in order to make it flow. Measurement of viscosity is by Redwood, Saybolt or Engler instrument flow times for a given volume of fuel. The ignition quality of a fuel is measured by the time delay between injection and combustion, which should be short for good controlled burning. Ignition quality is indicated as cetane number, diesel index and calculated cetane index; the higher the value the better the ignition quality of the fuel. The flash point is a figure obtained and used mainly to indicate the maximum safe storage temperature. The test determines the temperature at which the fuel will give off sufficient vapours to ignite when a flame is applied. Two values are possible: an open flash point for atmospheric heating, and a closed flash point when the fuel is covered while heating. Low-temperature properties are measured in terms of pour point and cloud point. The pour point is slightly above the temperature at which the fuel just flows under its own weight. It is the lowest temperature at which the fuel can be easily handled. At the cloud point waxes will form in the fuel. Below the cloud point temperature, pipe or filter blocking may occur. The carbon residue forming property of a fuel is usually measured by the Conradson method. Controlled burning of a fuel sample gives a measure of the residual carbon and other remains. Sulphur content is of importance since it is considered a cause of engine wear. A maximum limit, expressed as a percentage by weight, is usually included in specifications. The calorific value of a fuel is the heat energy released during combustion. Two values are used, the more common being the Higher Calorific Value, which is the heat energy resulting from combustion. The Lower Calorific Value is a measure of the heat energy available and does not include the heat energy contained in steam produced during combustion but passing away as exhaust. The measurement is obtained from a bomb calorimeter test where a small fuel quantity is burnt under controlled conditions. The various fuel properties have different effects on performance of the engine and the storage and handling requirements of the system. Blending and the use of various additives will also influence both the engine and the system. 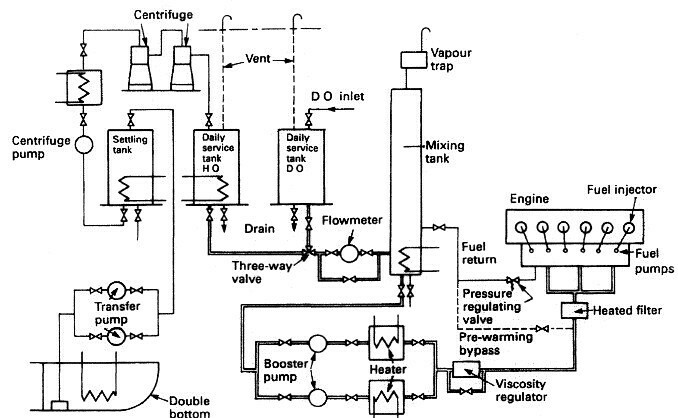 Viscosity will affect jerk-type injector pumps and injector operation since the liquid fuel is the operating medium. The pump mechanism is lubricated by the fuel which, if it is of low viscosity, will cause wear. Cloud point and pour point values are important when considering the lowest system operating temperatures. Wax deposited in filters and fuel lines will cause blockages and may restrict fuel flow to the engine. The cetane number or diesel index will determine injection timing and also influences the combustion noise and production of black smoke. The temperature in a fuel system should be progressively increased in order to deliver fuel at the correct viscosity to the injectors or burners. System cleanliness is also very important to reduce wear on the many finely machined parts in the fuel injection equipment. Regular attention to filters and general system cleanliness is essential. Various additives are used to, for instance, remove lacquer from metal surfaces, reduce wear and prevent rust. Fuel oils require treatment before passing to the engine. This will involve storage and heating to allow separation of water present, coarse and fine filtering to remove solid particles and also centrifuging. The centrifugal separator is used to separate two liquids, for example oil and water, or a liquid and solids as in contaminated oil. Separation is speeded up by the use of a centrifuge and can be arranged as a continuous process. Where a centrifuge is arranged to separate two liquids, it is known as a 'purifier'. Where a centrifuge is arranged to separate impurities and small amounts of water from oil it is known as a 'clarifier'. The separation of impurities and water from fuel oil is essential for good combustion. The removal of contaminating impurities from lubricating oil will reduce engine wear and possible breakdowns. The centrifuging of all but the most pure clean oils is therefore an absolute necessity. Fuel sludge may constitute up to 1% of fuel used on board. The sludge disposal is normally done either via burning on board (incinerator) or transfer ashore. The whole process is waste of energy and money. Finding ways of reducing sludge thus could be desirable. A homogenizer assists the process of fuel homogenizing and thereby a reduction is sludge level. It also helps with the supply of more uniform fuel to combustion systems. 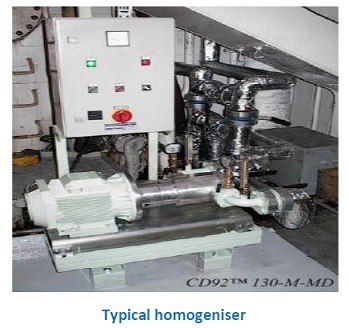 The main job of a homogenizer is to create a uniform structure of all solid and non-solid materials present in heavy fuel oil. A homogenizer also breaks down large water elements into small homogenous structure, resulting in an emulsion consisting of water molecules spread evenly throughout the whole fuel. A homogenizer mainly works by agitating and milling of the fuel. Agitation can be done by using a mechanical arrangement which pumps the liquid through an orifice plate. Such a system is shown in Figure . Agitation can also be done by an acoustic medium which uses ultrasonic frequency to agitate a surface over which the liquid is pumped. A conventional homogenizer is like a milling machine which churns the liquid as it passes through it. The design consists of fixed stator housing with a rotor which is generally driven by a motor. The mating surface of stator and rotor has specially designed channels. Both rotor and stator are conical in shape and have a specific clearance between them through which the fuel is passed. Moreover, the design is made in such a way that the liquid accelerates as it moves through the channel, making the dissolved components uniform in nature. It should be noted that although the unit looks like a pump, it doesn’t have a pumping unit. A separate pump needs to be installed to pump the fuel through the system. Reduction in sludge production (up to 75% has been claimed but a number of 40% is more realistic). This causes an increased amount of burnable fuel, thereby fuel saving and fuel cost. Also, this reduces the cost of disposing of the sludge. Less wear and tear of engine components. In case, a homogeniser is used for some water emulsification into fuel, it could positively impact exhaust pollutants as well. Both NOx and smoke reduction can be achieved if the system is used for water-fuel emulsification. The function of the fuel injection system is to provide the right amount of fuel at the right moment and in a suitable condition for the combustion process. There must therefore be some form of measured fuel supply, a means of timing the delivery and the atomisation of the fuel. Mechanical separation of solid contaminants from oil systems (fuel and lubricating) is achieved by the use of filters and strainers. A strainer is usually a coarse filter to remove the larger contaminating particles. Both are arranged as full flow units, usually mounted in pairs (duplex) with one as a standby..
Blending is the mixing of two fuels, usually a heavy fuel and marine diesel oil. The intention is to produce an intermediate-viscosity fuel suitable for use in auxiliary diesels. . Both fuel oils and lubricating oils require treatment before passing to the engine. This will involve storage and heating to allow separation of water present, coarse and fine filtering to remove solid particles and also centrifuging. Minute microorganisms, i.e. bacteria, can exist in lubricating oils and fuel oils. Under suitable conditions they can grow and multiply at phenomenal rates. Their presence leads to the formation of acids and sludge, metal staining, deposits and serious corrosion..
Changes in refinery techniques are resulting in heavy fuel oils with increased density and usually contaminated with catalytic fines. These are small particles of the catalysts used in the refining process. They are extremely abrasive and must be removed from the fuel before it enters the engine.